Hop on the red bus and head for some great bingo fun. You will find it very fitting that one of the UK’s favorite methods of public transit is used as the symbol for one of its favorite games. The red double decker bus theme is cute and clever, just right to get you in the mood for fun. And there’s fun galore at Red Bus Bingo; as well as plenty of bingo games, the site offers a chance to meet new people and try your hand at winning jolly good cash payouts. Registering as a member is very simple, and after that you can consult the Getting Started and FAQ sections as your road map to guide you along the Red Bus route. All aboard! First stop is one of the many lively bingo rooms, of course, to play your choice of 90 Ball Bingo, the time honored traditional game in Britain, or 75 Ball Bingo, imported from America on the other side of the pond. A true British bingo room wouldn’t be complete without a chat room in full swing, and Red Bus Bingo does not disappoint. Double Decker and London Eye are the theme appropriate names for Red Bus’s progressive jackpots. These can be won by covering your card completely in 37 calls or fewer for 90 Ball Bingo, or completing the London Eye pattern in 45 calls or fewer. 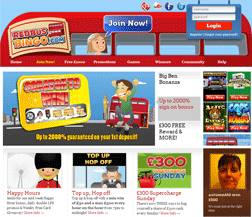 Besides bingo, Red Bus offers roulette, slots and instant win games. If you’re a new player, the Red Bus Bingo Scratchcard will reveal how big a welcome bonus you’ll receive – up to a mammoth 2000 percent. That is just the first of many promotions provided to members of the Red Bus site. Extra large prizes, free cards and penny games are on the road ahead. Don’t forget the often very lucrative prebuys and guaranteed jackpot games. Loyal players will enjoy the extra special care at the Joy Gem VIP Club. Move up through the Sapphire, Ruby and Diamond levels for more and better bonuses, cash prizes, personal services and gifts. Licensed in Gibraltar, Red Bus Bingo is operated by bingo pro Cassava Enterprises and owned by 888.com. You are in for a safe trip with Red Bus’s meticulous concern for fairness, responsibility and security. All your personal and financial details are kept under virtual lock and key using state of the art 128 bit SSL (Secure Sockets Layer) encryption technology. Red Bus’s caring attitude comes through in its customer support, as well. Whatever questions you may have about the site can be answered the customer support agents. Just contact them via live chat (from a bingo room or the website), email or telephone (toll free when calling on a land line in the UK).